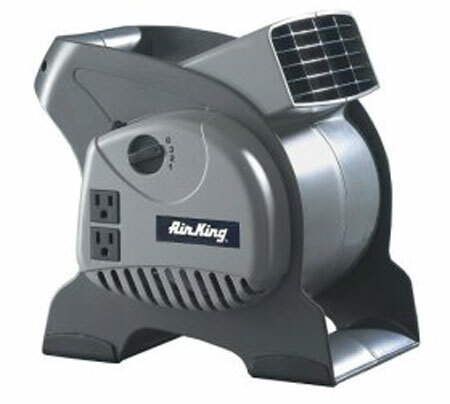 Amazon is currently listing this three-speed Air King blower for $37.23 with free super saver shipping. It features three blower speeds, a 1/16 HP motor, a pivoting head that offers airflow in three direction, a 10′ power cord, and two grounded outlets on the side to power other tools. It looks perfect for, say, drying out a basement or offering some ventilation in a closed workspace. I’ve had a “Blue Blower” now for several years, and I’ve found it to be surprisingly handy. It’s great for drying paint, removing noxious fumes, and just for keeping cool in hot workspaces. The Air King looks like a good quality unit at a lower price. We have the Stanley version of this little guy at home. It’s is without a doubt one of the best fans I’ve ever used. It barely takes up any space and it moves a TON of air. It’s also a good deal quieter than those massive industrial fans (though it still isn’t a whisper). It should be noted that the stream of air that comes out is pretty narrow/directed. Now I feel kinda stupid for paying something like $50 for a Blue Blower ten years ago. One speed (industrial), three positions (horizontal, tipped backwards precariously, or tipped downwards precariously), and one outlet on the side. This looks like a great deal.